Since the Fed started its new policy of "QE infinity" (which it stepped up on Wednesday), acclaim has been heaped upon the economists who have promoted a policy of NGDP targeting (or "NGDP level path targeting"), which bears some resemblance to "QE infinity". Chief among these economists is Scott Sumner, who promotes his ideas mainly through his blog; Sumner was recently named one of Foreign Policy Magazine's top 100 global thinkers, and economics pundits from Tyler Cowen to Matt Yglesias have credited Sumner as being the intellectual force behind the Fed's new policy. However, Scott is far from a solitary crusader; he has been assisted by David Beckworth, Ryan Avent, Andy Harless, Steve Randy Waldman, Joe Weisenthal, Evan Soltas, and a number of other bloggers and pundits. Additionally, my own graduate advisor, Miles Kimball, has promoted similar ideas on his blog and in his academic work. I generally support the idea of an activist Fed, unconventional monetary policy, etc. However, I do have a misgiving about a key element of the case made by the aforementioned crop of monetarists. This is the notion of an "Omnipotent Fed"...by which I mean not that the Fed can create stars and galaxies, but that the Fed can set NGDP to be whatever it wants. If this assumption is wrong, NGDP targeting (or similar policies) may simply not work. To some, the proposition that the Fed can hit any NGDP target seems self-evident. NGDP is just real GDP multiplied by the price level; if the Fed perfectly controls the price level, and either A) knows the relationship between the price level and output, or B) can change the price level faster than real output changes, then it immediately follows that the Fed sets NGDP. You often hear this stated as the idea that "the Fed can always choose to inflate". But what if the Fed can't set the price level? There are several ways this could be the case. For example, the price level might be discontinuous in certain regions. For example, suppose the Fed attempts to set inflation at exactly 176.73%. But it might be the case that any monetary policy that pushes inflation above 175% will automatically cause inflation to jump to 190% (and vice versa). In other words, suppose that in some region, NGDP is a step function with respect to monetary policy. That's just one example, though; in general, any time NGDP is an unstable, stochastic, or undetermined function of monetary policy, the "omnipotent Fed" proposition fails. One special case of this is Milton Friedman's idea that monetary policy acts with "long and variable lags", a notion that has been pooh-poohed by the new monetarists. Anyway, OK, so is the Fed "omnipotent" or not? Well, how on Earth could we know? My big problem with the "Omnipotent Fed" idea is that it seems non-falsifiable. By which I mean, it doesn't seem like the evidence will ever be able to tell us whether the Fed is omnipotent or not. Why not? Two reasons: A) Because the Fed's thought process is unobservable, and B) Because the Fed's policy toolkit is unobservable. To know what the Fed can do, we have to know what the Fed tries to do. For example, suppose we see the Fed do $1 trillion of quantitative easing, and NGDP doesn't seem to budge much. Interpretation 1: The Fed knew that its actions would lead to a non-budging NGDP level, which is why it did what it did. In other words, the Fed chose to keep NGDP where it was, and if it had wanted to, it could have raised NGDP instead of just keeping it static. Interpretation 2: The Fed tried to raise NGDP and failed. It failed because the people at the Fed made a mistake. They did the wrong kind of easing, or didn't manage expectations correctly, or in some other way used the wrong tools. If the Fed had used the right tools, it could have raised NGDP. Interpretation 3: The Fed tried to raise NGDP and failed. It failed because the only way to raise NGDP would have been to cause a hyperinflation, which would raise NGDP by much, much more than it wanted. There are more interpretations. I just highlighted these three to demonstrate a point. How can you know what the Fed wants? You can make some guesses, but not scientific ones. The Fed keeps its decision-making process secret. And suppose you somehow could figure out what the Fed wants (say, by applying a mind-reading device to the Fed chairman during a policy announcement). That would tell you precious little about what the Fed is actually capable of. For example, suppose that expectations are very important in the determination of NGDP. Do we know what determines expectations? Not really, no. Or suppose money demand is unstable, or contains hysteresis, in certain regions. How would we know that? Some people have claimed that an "NGDP futures market" would allow us to test the proposition of Fed omnipotence. If NGDP futures were stable, they say, that would show that the Fed can hit any NGDP target it likes. But this is just flat-out false. Low NGDP futures volatility could mean that the Fed is utterly powerless, and that investors simply expect few shocks to NGDP. So it seems to me that the proposition of Fed omnipotence is something that we can only believe by making a leap of faith. It is functionally equivalent to the notion that an invisible God controls everything we see in the world. Thus, believers in the Omnipotent Fed will always be able to claim, without scientific or logical refutation, that every jump and juggle of NGDP was the deliberate choice of the Fed. Does this mean that every question about monetary policy is fundamentally unanswerable? No, it doesn't. We can't observe the Fed's desires, and we definitely can't observe the Fed's total choice set. But we can observe the Fed's actual choices. If you tell me "Inflation always rises 1 for 1 with the monetary base," well, that is an easy proposition to falsify. So what is the implication for monetary policy? I am not claiming that NGDP targeting is a bad idea, or that it definitely will not work, or even that it is unlikely to work. What I'm claiming is that, in the presence of true Knightian uncertainty about the power of the Fed, it is certain that at some point, if NGDP targeting doesn't seem to work, we will inevitably abandon the policy. And the point where we decide it has failed will depend not on scientific fact, but on intuition and heuristics. In other words, if the Fed keeps printing money and NGDP doesn't return to its pre-crisis path, at some point we will simply start to entertain the notion that the Fed is incapable of doing what we want it to do. And then we will try to think of something else. And of course the true believers will say: "No, the Fed could have done it, they just didn't really want to." And we won't be able to prove them wrong. It is certainly a logical possibility that the Fed can't get inflation up without overshooting...The difference is that I don't think the US is actually in that situation of having to overshoot. Japan may be. Saying that the Fed can hit any NGDP target it wants because it can buy bonds is like saying that NOAA can "control the weather" because there is some limited cloud seeding capabilities. In both cases, there is some influence, but it is hardly control because there are vastly, vastly, vastly more factors in play. It is essentially similar to the notion in ABCT that all business cycles in economies with central banks are caused by the central bank. There is some degree of influence — and central banks can certainly cause bubble — but that is not the same thing as 1:1 influence. On the other hand it is reasonable to assume that had we had an NGDP regime in the 1990s and early 00s, policy might have been significantly tighter, and the bubble might have been significantly smaller. So, yeah. But is that a case of monetarists shutting the stable door after the horse has bolted? First line should read "...because it can buy bonds and issue forward guidence (etc etc etc...)". One possibility is that the tools the Fed has are insufficient to cause any inflation at the zero lower bound. They can only introduce money into circulation by buying bonds, and this is limited by the availability of bonds to buy, but even before you hit that limit, simply putting money in the hands of people who used to have bonds isn't necessarily going to induce them to spend it, so there's no guarantee of inflation. Bonds are held by people looking to save. In normal times buying them would most likely cause them to buy some other financial instrument (loaning to someone else) but there is a limit to how much can be loaned with an expectation of making it back. It's quite possible that printing money will lead to cash hoarding or a gold bubble instead of general inflation. Buying bonds does not introduce money into circulation, it only adds reserves to bank balance sheets. The reason NGDP targeting won't work is because reserves and the money supply do not correlate. The Fed policy only works if there is some mechanism by which the credit gets to the intended uses. It would probably be easier (and less dangerous) to fix credit channels than to try to overwhelm them with cheap money. At this point it looks like the Fed is pushing on a string in the hopes that it will help a little bit because the Legislative and Administrative branches of government are paralyzed. Do any other countries practice NGDP policy? Australia, Sweden, Israel? That would lead credence to the idea that the Fed can practice NGDP. I know it's a conceptual difference more than anything, but this crosses the line into fiscal policy, which is the opposite of what NGDP targeters have been advocating with their 'the fed is omnipotent, fiscal policy is useless' ideas. Interesting post. With you, it's sometimes the physicist, sometimes the economist talking and this post is certainly the physicist. I think the crop of monetarists you mentioned believe in Fed's omnipotence more than the Fed does ;). For example, consider this paper by a former economic adviser at the BIS, William White (who has also been associated with Fed Dallas). In complex adaptive systems with significant non-linearity and unpredictable dynamics, it is far from clear whether the Fed can actually deliver credibly. The NGDP advocates should at least to some degree believe that the transmission mechanism for the monetary policy works. What if this transmission mechanism is broken? Good point likening belief in the Fed to belief in God. This may actually be an attack line that works. "Take THAT monetarists! You believe in GOD! Fools." I'm not sure I agree that the NGDP thing is not falsifiable, though. The strong form of the omnipotent Fed theory holds that the Fed merely has to promise to act, and then expectations will do the work for it (this is the "Chuck Norris" position). That can certainly be tested, and has. As Robert Waldmann has pointed out in response to the Chuck Norris argument, throughout the 70s the central bank chairman would shake his fist and say he'd do anything it took to get inflation down. It didn't work, no matter how hard he promised. Can the omnipotent Fed/Chuck Norris people get around this? If the defense is "well, it wasn't a /credible/ promise", then we are in no-true-Scotsman territory, and the claim is indeed not falsifiable. There is not magic formula to make a threat credible, as any parent or teacher will tell you. A gun probably helps (the Terror did a fabulous job of stabilizing the value of the Assignat, whatever else one thinks of it), but I'm not sure Ben Bernanke has the authority to go there. I think, too, that if Noah looked into the Post Keynesian view of money, he would see another fairly substantial reason to be skeptical of the Fed's omnipotence. If monetarism and the Quantity Theory of Money are both mistaken, then the role of the central bank looks much, much different, and it is mainly a reactive, rather than a proactive, institution. Sounds rather like the world we live in, no? I love your final paragraph. A look at empirical data shows that the Fed Funds interest rate set by the Fed always [100% always] FOLLOWS moves in 3 mo. T-Bill rates, gong up and going down. The delay is greatest at major turns. I took a lot of flack in comments to my Angry Bear post where I said the Fed is a market follower. Objections mainly boil down to expectations-based ideas. Nice theory [though I think it bears a disturbing resemblance to wishfull thinking], but no objective evidence, or even a convincing argument, that my contention is wrong. The vehemence of the reaction to the "Fed follows" perspective is strange. I think it shows that people have an emotional investment in some aspect of the textbook account. It's probably exactly the same as people's emotional investment in God, the benevolence of our historical forebearers, astrology, and on and on. We want to believe there is someone or something good out there who can help us. As a general matter, I will disagree with your assertion that time flows in only one direction, but that's a different kettle of fish altogether. "Minimum wage laws lower employment." All of these have very clear theoretical answers (in my not so humble opinion). Falsifying/not-falsifying any of these, on the other hand, is extraordinarily difficult. Macro is just such a complex science with so many variables. It's not difficult to find pundits who don't think NGDP will work: Joseph Stiglitz, Michael Woodford etc. Even Monetarists like Steve Williamson argues that NGDP is powerless. Some NGDP advocates are actually motivated more by ideology than by economic arguments: Tyler Cowen, Scott Sumner and David Beckworth. Woodford says something very to the point, "the most obvious recipe for success is one that requires coordination between the monetary and ﬁscal authorities. The most obvious source of a boost to current aggregate demand that would not depend solely on expectational channels is ﬁscal stimulus — whether through an increase in government purchases, tax incentives for current expenditure such as an investment tax credit, or subsidies for lending like the FLS". Only because the claim (that the Fed is not omnipotent) is true. Four years of unsuccessful attempts to inflate would indicate the Fed often doesn't know what it is doing. Along the same lines, it's annoying that some people use a definition of "easy/tight money" which assumes that their theories are true, rather than a theory neutral definition. (Example of a theory neutral definition: easy money = steep yield curve, tight money = inverted yield curve). Yes. It makes the entire exercise circular, and I'm convinced that's all NGDP targeting is. During the seventies, central bankers, particularly Burns, insisted that inflation was caused by things outside of the Fed's control. I think the notion that there is a step function with no stops before hyperinflation is absurd. Excessive nominal GDP growth can be controlled. The only problem is if central bankers say that short term nominal interest rates or unemployment rates can't be allowed to go too high. The more reasonable concern is that slow nominal GDP growth paths are not feasible because equilibrium real interest rates are too negative. For example, 7% nominal GDP growth is as low as possible, so that a 5% inflation rate will allow for -5% real interest rates. Anything slower would, in equilibrium, result in a real interest rate that is not sufficiently negative. That this could be a problem is obvious, and simply requires consideration of much slower growth rates than 5% or even 3%. For example 1%, 0% or -1%. If nominal GDP growth requires trend deflation, then excessively high real interest rates would be an obvious problem. Sumner grants this is possible with his preferred 5% growth rate, though usually insists that current low real interest rates are due to bad expectations. Move back to a higher growth path of nominal GDP, and real interest rates will all be positive. The opposite view is that once the growth path is reached, and real growth slows to potential (say 2.5%) and inflation to 2.5% as well (5% -2.5%), the real interest rate will remain below -2.5%. So, this cannot be maintained. One answer is to shift to a higher growth rate and higher inflation. However, before that is done, modestly negative interest rates on reserves (rather than slightly positive ones) should be implemented, and after that, the Fed will just have to hold a large portfolio of risky assets. Not all real interest rates are negative. It is the ones that central banks like to target that are very low. By the way, we generally would say that it becomes appropriate to question the effectiveness of monetary policy after interest rates on reserves are slightly negative and the entire national debt is in the hands of the central bank (including agency securities.) Then we will talk about it. See, I think you've convinced yourself of all this, and fine, maybe you're right, but how can the rest of humanity know that your hunches represent reality? 1. Monetary policy is powerless at the ZLB but not above the ZLB. 2. Expectations of higher inflation and/or higher real GDP growth will increase current demand for given nominal interest rates. 3. The US economy will stay at the ZLB forever. All New Keynesian macroeconomists believe both parts of 2. It's right there in the Euler IS. And "forever" is a very long time. He "handles it very well" by saying "I don't think that's very likely." Fine, but I'm hardly convinced. It's right there in the Euler IS. Don't forget the investment Euler equation too. Or a simple Old Keynesian accelerator model of investment would do the job just as well. One of the things that is holding back investment is firms' (entirely rational) fear that they might not be able to sell the extra output that extra investment could produce, because future demand may not be strong enough. Sure, ultimately nobody really knows anything. But that isn't an argument for doing "nothing". We don't even know what "doing nothing" means. We look at theory, we look at history (e.g. Roosevelt), do what we think looks best, and cross our fingers. That, unfortunately, is the human condition in all our endeavours. But that isn't an argument for doing "nothing". Oh of course. And note that I support doing a lot of "something" right now! Unless you believe in Austrian-type "credit market distortions", the one and only danger of NGDP targeting is a "snap-up" in inflation, which I think is unlikely enough at this point to discount entirely. Alternatively, one can believe in fiscal policy. And Roosevelt did it, by announcing a (higher) price level target, and devaluing the USD against gold. Is today's Fed less powerful or less competent than in Roosevelt's day? Or maybe conditions are just different than then. Or maybe that policy and NGDP targeting are fundamentally different in a way you haven't thought about. Roosevelt didn't "devalue" the dollar againat gold, he took the United States off the gold standard entirely and freed the federal government to increase private sector net financial assets via deficit spending. To argue the Fed engineer a recovery via monetary policy is simply ahistorical: the private sector spent the Great Depression deleveraging. It didn't releverage, which is the only method by which monetary policy can expand the money supply. Again, no mention of or even evidence of a casual thought given toward fiscal policy. I believe FDR may have used some. The question is whether the Fed can do more while the Republicans set off an austerity bomb on the fiscal side. We're about to find out. Objective people can look at the data. Correlation doesn't entail causation, but over the past few years whenever inflation expectations started plunging, Bernanke did a QE and they went back up again. No he says they'll tolerate 2.5 percent inflation without jacking rates. "However, I do have a misgiving about a key element of the case made by the aforementioned crop of monetarists. This is the notion of an "Omnipotent Fed"..."
Besides Sumner, is this true or a straw man? "To some, the proposition that the Fed can hit any NGDP target seems self-evident. NGDP is just real GDP multiplied by the price level; if the Fed perfectly controls the price level, and either A) knows the relationship between the price level and output, or B) can change the price level faster than real output changes, then it immediately follows that the Fed sets NGDP. You often hear this stated as the idea that "the Fed can always choose to inflate"." I have been stumbling through "Red Plenty" and the above paragraph has some resonance for me. @Nick: "3. The US economy will stay at the ZLB forever." I've been wondering if this might be so, at least approximately. I'm thinking '71, Bretton Woods. Following some wild swings in the decade after the world went fiat, with the system (including monetary policy) adjusting to the new regime, we've seen a steady decline in interest rates to a point approaching zero. We all think in terms of interest rates eventually rising as they have historically. Are we driving by looking in the rearview mirror, ignoring the curve in the road that happened on '71? This would suggest that yes, the Fed moves last, but it moves under compunction. The Fed itself could conduct fairly definitive experiments, no? In fact, they would just have to escrow their planned protocol with a trusted party until the experiment were over. No special techniques would even need to be invented. So I think this dispels your criticism that the hypothesis in unfalsifiable. Now, the Fed may refuse to perform the experiment, but that's a rather different kettle of fish. If a bunch of respected macro economists endorsed such an experiment and helped design the general framework, but the Fed refused, then you'd really have some ammunition! You pull a little logical switcheroo on us here. First you say Fed omnipotence is an unacceptable hypothesis because it can't be empirically refuted. Then we offer NGDP futures targeting as a way to refute it potentially (i.e. if the futures market turns out to be unstable). Then you say, but if it doesn't get refuted (i.e., if the futures market turns out to be stable), then we won't know if it's true or not. Dude, that's the way it works with working hypotheses: you keep assuming the working hypothesis until you get refuting evidence. You can make a more subtle argument, that Fed omnipotence is not a very good working hypothesis because it would be difficult to refute empirically. (Not sure I find that argument convincing, but I'm open to your making the case.) But as for its being impossible to refute empirically, that is "just flat out false." Of course, I grant you, even if the futures did prove unstable, Scott Sumner might come up with some kind of epicycles to save the Fed omnipotence paradigm, but from my point of view, it would be effectively zombified (just as the Fed's experiment in the early 1980's effectively zombified the original monetarist proposition). But you know well that almost every corner of the economics profession has its share of intellectual necrophiles, so the fact that some people will still believe it after it's been refuted does not distinguish the Omnipotent Fed Hypothesis from any other hypothesis in economics. But you're just not right...the behavior of an NGDP futures market doesn't really tell s anything about the validity of the Omnipotent Fed proposition. 3. An "excluded middle" in Krugman's sense (or, as you put it, that NGDP is a step function). 4. Something really weird about the world that isn't contemplated in any conventional macroeconomic models. If 1, 2, or 3 is the case in today's situation, and if the Fed undertakes a NGDP future targeting policy, the market will be unstable (in the sense that the Fed's inventory, if it makes a market in NGDP futures, will either be explosive or have wild swings). This would refute the OFP. Now, you could argue, maybe the market is just unstable because traders are crazy. So the observation wouldn't absolutely refute the OFP; it would refute the joint hypothesis of the OFP and some assumption about market behavior that limits the craziness of traders. Personally I'm willing to make that assumption (unless someone can convince me that the required limit on craziness is implausibly low). But there's almost nothing in economics that you can prove or disprove without making some assumptions. But there's almost nothing in economics that you can prove or disprove without making some assumptions. In all seriousness, isn't this the exact equivalent of saying, "But there's almost nothing in economics that you can prove or disprove?" A proof based on assumptions is not proof, it is confirmation bias going incognito. Ah, but here's where I disagree. First of all, the Fed's true commitment to such an announced policy can always be called into question by OFP supporters. Second of all, OFP supporters can always claim that the Fed simply didn't use the correct tools to hit the target. Now, you could argue, maybe the market is just unstable because traders are crazy. So the observation wouldn't absolutely refute the OFP; it would refute the joint hypothesis of the OFP and some assumption about market behavior that limits the craziness of traders. This is also a problem with the idea of a futures market as a laboratory. Excess price volatility is well-established in stock markets; in your proposed futures market, excess demand volatility would be analogous. There is every reason to expect such volatility, given our historical experience, even without swings in realized future NGDP. "First of all, the Fed's true commitment to such an announced policy can always be called into question by OFP supporters. Second of all, OFP supporters can always claim that the Fed simply didn't use the correct tools to hit the target." Two different kinds of epicycles that could be hypothesized to save the Monetary Omnipotence Paradigm. But it would be a zombie anyhow. In fact, though, I think Sumner's proposal (at least one version of it) rules out both of these kinds of epicycles, because he has the Fed doing mechanical policy reactions (e.g., buy a proporational amount of gov't securities) to changes in its futures position. He couldn't very well object, after the fact, that his own formula was wrong (or that it lacked credibility), and if he did, he'd sound like an obvious zombie. There is every reason to expect such volatility, given our historical experience, even without swings in realized future NGDP. There are different degrees of excess. We can measure historical price volatility in stock markets and ascertain what the comparable amount of volatility in NGDP futures demand would be. If the actual volatility turns out to be significantly larger, then the MOP is refuted. If not, well, again, you can argue that the hypothesis isn't a good one because feasible tests don't have enough power, but at present I still disagree, and in any case this is a different issue from whether it is absolutely untestable. Two different kinds of epicycles that could be hypothesized to save the Monetary Omnipotence Paradigm. He couldn't very well object, after the fact, that his own formula was wrong (or that it lacked credibility), and if he did, he'd sound like an obvious zombie. There are different degrees of excess. We can measure historical price volatility in stock markets and ascertain what the comparable amount of volatility in NGDP futures demand would be. I'm not sure this would work, since historical stock market excess volatility seems to vary significantly by time period (see Shiller). What about Interpretation 4: the opposite proposition - that the Fed is impotent, and most particularly and obviously so at the ZIRB? While it's true that we can't read the collective mind of the Fed, can we not assume that their purpose ought to be to make things better [from some perspective] and that they take actions on that basis? And then, if things haven't gotten better, they have therefore failed? Per the linked NPR article, the Fed isn't targeting NGDP, they are [sort of] targeting an unemployment level. Oh, wait - that's half of their dual mandate. Let me note that, as an absolutely general proposition, the Monetary Omnipotence Proposition (MOP) clearly fails. 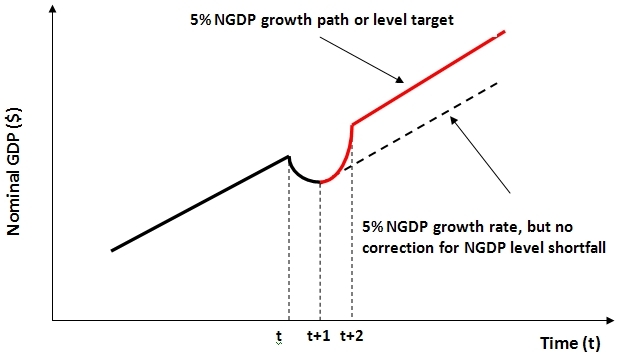 It's easy to model a situation in which monetary policy cannot achieve certain targets for NGDP. The question is whether we are actually in such a situation. Scott Sumner would say it's implausible that such a situation could ever occur in the real world, but since implausibility is subjective, that's obviously not a proposition that can be empirically tested. So if you're notion of what's plausible differs from Scott's (as mine does), then you have to allow for the possibility that, even if the Fed is omnipotent under today's circumstances, it's possible that conditions in some future world will cause it to lose that omnipotence. Again, the general MOP is not interesting because it's obviously false. The interesting question is whether the MOP applies in circumstances comparable to those we face now. And that is testable, as noted in my other comment and my reply to your reply. The question is whether we are actually in such a situation. The interesting question is whether the MOP applies in circumstances comparable to those we face now. And that is testable, as noted in my other comment and my reply to your reply. Disagree, and see my reply. High volatility in NGDP futures markets could be interpreted by current-MOP proponents as an indication of the lack of a true Fed commitment to NGDP targeting, or Fed incompetence. Additionally, NGDP futures market demand might be more volatile than realized future NGDP. See my reply to your reply to my reply to your reply to the earlier comment. But I might also make a general response to the overall topic of this post, given the way you have interpreted it: who cares? Let's say you're right and the hypothesis is untestable. Who cares? Try a regime based on the hypothesis. If the results are unacceptable, the hypothesis may still not be wrong, but it's useless. From the point of view of a pragmatist, that is the same thing. 1. Will the Fed's eventual actions to hit the target path result in unacceptable outcomes (too much inflation during the catch-up period and/or an unacceptably severe recession at the end of the catch-up period)? 2. Will the Fed actually do what it promises (which might be mandated by law, in which case it becomes a question of whether Congress would pass a law rescinding the old law)? 3. To what extent will private agents' anticipation of a future inflationary catch-up boom result in a quicker recovery? 4. To what extent will anticipation of future distasteful catch-up inflation motivate the Fed to be more aggressive beforehand, so as to result in a quicker recovery? Personally, I think an economy that has insufficient real growth for years, particularly if it's for demand-side reasons, deserves to be punished in an eye-for-an-eye manner with inflation. So even if the answers to questions 1, 3, and 4 above are disappointing, I still support an NGDP targeting mandate, because it's the right thing to do. As for question 2, yeah, that's a problem. These damned liberals who would want amnesty for a misbehaving economy instead of giving it the punishment it deserves, I don't know what to do about them. But I still say, if they're going to be among the damned, that is God's will, and we should still do the right thing now. And another thing, if you accept (as almost all mainsteam economists do) the assumptions that (1) the ZLB will eventually no longer be binding and (2) monetary policy is omnipotent in the relevant sense to the extent that the ZLB does not bind, then it's analytically true that the Fed can successfully target NGDP given a sufficiently long horizon (i.e., long enough that the ZLB will no longer bind at the end and there is enough time for catch-up afterward). This I disagree with; to see why, see Miles' comment about the theoretical possibility of an "inflation snap-up". I don't see how inflation snap-up would prevent successful NGDP targeting in the long run. If it snaps up, you wait until you've reached the target and then tighten again. (Since inflation is a first derivative, it's not possible for a snap-up in inflation to overshoot the target immediately. I suppose theoretically there could be a discontinuity in NGDP, but that's more likely to be because of a change in real output.) You might get more volatility in NGDP than you would prefer, but you can hit the target. I don't see how inflation snap-up would prevent successful NGDP targeting in the long run. The "Omnipotent Fed" idea is the idea that the Fed fully determines the time path of NGDP, not that it can hit a level of NGDP at some ex ante unknown time t > 0. I agree entirely. But the claim that the Fed can target nominal GDP absolutely does not follow from "the Fed can always choose to inflate". If target 2013 nominal GDP were say 10% of 2011 GDP then the Fed would have to deflate. More generally, the argument that the Fed can always inflate only makes sense if the Fed can always disinflate. The logic implies that once the FOMC makes it clear that it will do what it takes to get inflation down to say 4% inflation and expected inflation will fall to 4%. The Fed tried that. It didn't work out that way. In fact disinflation followed huge nominal and real FF rates and a severe recession. If you are aware of any argument that inflating and disinflating are asymmetric so that a Fed inflation target can always be met if so long as it is higher than current inflation but can't be met if it is sharply lower, please tell me. I know Yglesias wasn't reading the papers in the 70s, 81 and 82 (he's smart but didn't read before he was 2. But he couild look up the debate. Is his argument that Paul Volker and Margeret Thatcher were perceived to be whimps in 1982 ? Or what ? More generally, the argument that the Fed can always inflate only makes sense if the Fed can always disinflate. This is only true if Fed power is symmetric, as your continuation suggests. You are assuming [I assume] symmetry. Or is there some evidence for symmetry? In some regime, frex, the ZIRB, Fed power has to be asymmetric because there is no Upper IRB. Re your update from Miles Kimball: I'm pretty sure that means that Miles believes the US IS curve slopes up. (That loosening monetary policy would cause the real interest rate to rise.) Welcome to the club, Miles! Off topic: My eyes! Something has gone wrong with your blog, Noah! Hmmm. Your blog has gone back to normal now. It must be my cheap crappy old computer. Well, Miles raises the possibility of a "snap-up" in inflation, which is just what I mean when I talk about discontinuities in the NGDP function of policy. To poo poo "long and variable lags" they have to poo poo all of the data. The long lags hypothesis is very testable. The instant effect hypothesis has been tested and is known to be false. This is not at all controversial in the literature DSGE models have investment planning lags to fit that stylized fact (as always one free parameter per stylized fact but that's another rant). As far as I know the NGDP targetters do not distinguish aiming for higher and for lower inflation (sorry see comment above). Suppose we saw 1000 trillion in QE and etc is not very hypothetical. We saw $600 billion of QE2 with (almost exactly) no detectable effects and they are undaunted. I'm pretty sure after all that I disagree with you. I think the hypothesis is as testable as any hypothesis which means it can only be tested along with auxiliary hypotheses (the policy will never be exactly like the proposal but sensible people can tell it is similar). I think the problem here is that the nominal GDP targetters dismiss all evidence which does not involve the FOMC saying exactly what they propose word for word. In particular data from last week should have been the last nail int the coffin. The claim is that the FOMC can affect expectations as it pleases. Clearly they aimed for higher expected inflation. The announcement was a surprise. Nothing much happened in bond and TIPS markets. I think the debate should be over (of course I also think it should never have begun). It is a distraction from discussion of the possibly effective policy available to the Fed -- massive purchases of newly issued MBS. By the way I suspect that Bernanke is more influenced by Woodford than by Sumner and, in an interview, Woodford said he was not influenced by Sumner. "DM: One big advocate of an NGDP target, on his blog and elsewhere, has been Scott Sumner at Bentley University. Did he influence your thinking on this? "So philosophically, this represents a conversion to the Evans criterion for rates and the Woodford/Krugman doctrine about monetary policy in a liquidity trap. Substantively, however, there isn’t that much going on here. As it was, however, few people expected the Fed to pull an ECB in any case. That’s reflected in the market reaction: rates actually rose, and expected inflation, as measured by the spread between nominal and real rates, went up only slightly. Sorry, but this move, while it speaks well of the Fed’s learning process, was not a game-changer." He's impressive that way (among others). If the hypothesis is testable, it was tested and rejected last week. Of course it was also tested by QEII, QEIII and the volcker deflation. I don't think you and I really disagree about the testability. My point is that no matter what happens, Omnipotent Fed proponents can still claim that either the Fed wanted the outcome it got, or else that it didn't know its whole toolkit. And we can't prove them wrong. Can we convince ourselves that NGDP targeting doesn't always work? Sure. Thanos omnipotent? Didn't he get routinely beaten up by Silver Surfer and guys like Thor? Geez, don't remind me. I bought like three copies of issue #1. They're probably worth less than what I paid. But the series was really good. At least, I liked it. It got me thinking about metadesire, and d-mod, when I was only 13. Don't bring up the Silver Surfer. My undergrad roommate and I had the original launch of these in our possession (circa 1968) as we were both Marvel heads. Of course after they were read they went into the trash bin because we were not prescient enough to realize that comic books would become insane collectables (almost as dumb as an economist thinking he/she can make credible predictions). The Fed is mot a deity and believing in an economic school of thought like a religion by some, is not realistic. I'm curious what you think is the effect of debt on demand. Do you think there's evidence to support that change in debt changes aggregate demand? Or do you think that change in debt is demand-neutral? Here's a question: suppose debt were outlawed entirely (e.g., if the world were run by Islamic law). Would aggregate demand then be zero, or constant in time? I don't think aggregate demand will go to zero because people will still need the basic necessities. Instead of credit and cash circulating in the economy today, people would switch to a medium that they can easily transact with, that everyone can easily identify. I also don't think aggregate demand will be constant in time because it will still fluctuate with people's incomes (which can be denominated in whatever medium that is considered as 'paid in full'). But this does not mean that change in debt will not have *any effect* on aggregate demand. For instance, there was clearly a mortgage debt boom at the household level from 2000 to 2006. Did that debt boom fuel the jobs in residential construction, real estate, financial industry etc. at the time, which vaporized once the housing bubble busted? Have you got the source of this quotation? I googled it many times but didn't find anything. In particular, it is quite possible for the Fed to be able to cause any degree of inflation it desires, and therefore be "omnipotent (sense 1)", but also for the Fed to recognize that doing so will cause more harm than good, and therefore not be "omnipotent (sense 2)". In this view, the Fed could do what Sumner wants, if it used every capability it had. But the Fed does not do so, not because it's incapable exactly, nor because it's run by fools who can't figure out how to do so, but because it is incapable of making it work out like Sumner thinks it will. The price will be too high. Why might the price be too high? Well, it might cause a bubble. The Fed just got a very painful lesson in blowing bubbles; it might not want to go there again. Why might this result in a bubble? Well, how will the Fed create inflation? By buying stuff. What kind of stuff? Financial instruments. This raises prices... of financial instruments. It doesn't raise the price of clothes and food and computers and cars, but it raises the prices of stocks and bonds and stuff like that. Inflation in financial instruments but not in real stuff - that smells like a bubble. Worse, it doesn't seem like it's going to do what Sumner wants, which is to cause inflation in the real (non-financial-instrument) economy. Could the Fed cause inflation in the real economy? Sure, if it bought cars and food and clothes and computers, instead of bonds. Is it ever going to do that? I doubt it... but I suppose it could. Anyway, I think this idea - that there are two different meanings of "omnipotent" - might explain a lot of the disagreement here. "It is certainly a logical possibility that the Fed can't get inflation up without overshooting...The difference is that I don't think the US is actually in that situation of having to overshoot. Japan may be." In addition, the overshoot has to be fast. The Fed is well set up to deal with slowly increasing inflation. The Fed most likely can't hit an NGDP target in levels or growth rates. But that's not the argument that Sumner makes. What the Fed should be targeting is the expected level of NGDP, and saying that they can't do that is equivalent to saying that either (i) the Fed can't affect NGDP expectations at all, or (ii) the Fed can affect expectations, but only in a discontinuous manner. You might have an argument on the second point, but you'll have to actually make it if you want to change any Market Monetarist minds.